People were not joking about the third trimester. I have some swelling in my legs and feet, my congestion is reaching ridiculous levels, and I walk pretty slowly. More accurately, I have to force myself to walk instead of waddle. I did what used to be a straightforward yoga flow today, and man, it kicked my heart rate up. A lot of the poses are way harder with 15+ extra pounds on my front. Still, none of these symptoms are more than moderate. It does make me wonder, though, how women with severe symptoms make it through these last months. I already feel that pregnancy should be a full-time job: trying to eat healthy, exercise, plan the baby’s room, write thank you notes, learn literally everything, plan for labor, figure out what’s happening after she’s born, etc., etc.. It’s a lot, and I can’t even imagine how women who feel truly crappy–or are on bedrest!–manage. Hats off to any of you, if that’s been your story. Healthy, for me, means carb counting–through this pregnancy, and likely a while after, to make sure the gestational diabetes stays gestational and not permanent. My diabetes educator told me not to worry about fat or calories: worrying about the latter causes people to eat way too many carbs, and worrying about the former causes people to…not eat. Here’s a secret to food blogging: write about what you want to eat. Right now, I’m dreaming about sweets. Thus, this low-carb cookie recipe! 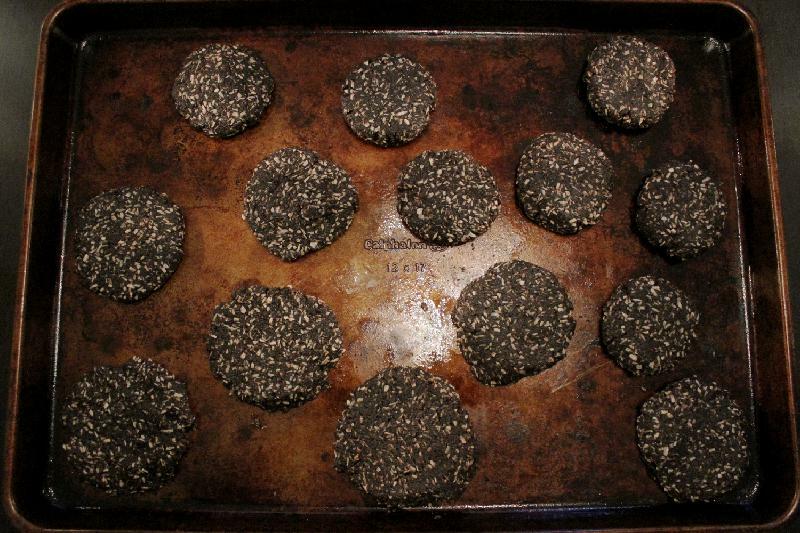 These cookies, like a lot of the recipes here, are an experiment. I’ve included nutrition information at the end (derived from MyFitnessPal, which does turn out to be a pretty helpful app, even in the free version–and no, no one paid me to say that). These cookies are lower in carbs, lower in fat, and higher in protein than a conventional chocolate chip cookie. Bonus: they’re gluten-free! There is a trade off in that they don’t have the taste or texture of a traditional cookie. These are good for: low-carb or gluten-free lifestyles; if you like your desserts on the less-sweet side; or if you’re a true cookie hoarder and can’t have enough recipes in your arsenal. There are two main differences between this and conventional cookie recipes. One is the flour. Regular flour is what creates a cookie’s texture, whether it’s more cakey or chewy. Second is the sugar. In a traditional cookie, sugar adds sweetness (obviously) and flavor enhancement, provides color through caramelization, and causes the spreading that you’re used to. This recipe swaps in almond flour, which is higher in fat but high in protein, and greatly reduces the sugar. 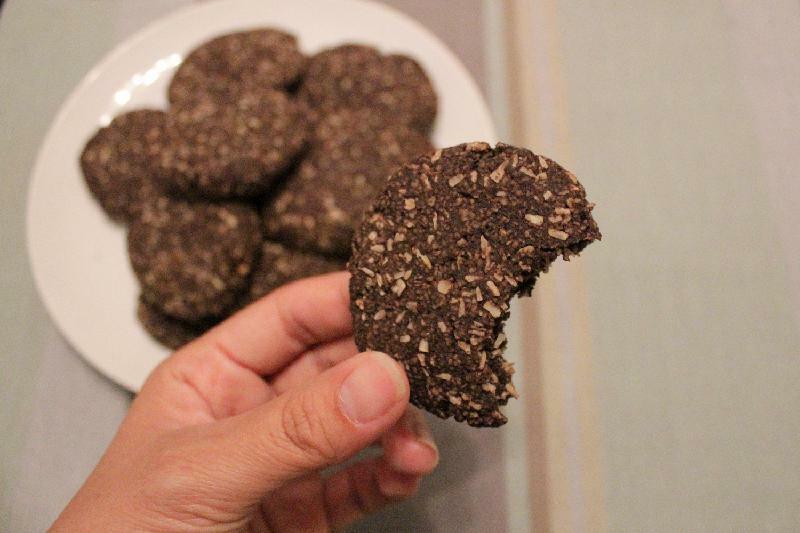 This produces a very different kind of cookie, almost like a chocolate-coconut biscuit. There’s one secret to these: while there’s very little sugar in the dough, rolling them in sugar before baking adds more sweet flavor without actually adding significant sugar. Also, they don’t really spread, so you’ll want to gently flatten them with your hand or a fork. I recommend leaving them thicker in order to get a bit more of that chewy texture in the middle. Got any delicious low-carb desserts you love? Please share them with me! I am accepting any and all suggestions. Adapted with thanks from Ditch the Carbs! Nutrition: Yield, 14 servings. Serving size, 1 cookie. Per serving: 138 calories; 6 g carbs; 12 g fat; 4 g protein. Line a baking sheet with parchment paper. Pour about 1/4 cup sugar into a small bowl and set aside. Combine dry ingredients in a medium bowl; set aside. In a large bowl, cream together butter and sugar. Beat in eggs, one at a time; stir in vanilla. Mix dry ingredients into wet. Form into 14 balls. Roll cookie dough ball each in sugar and place on the baking tray. Use a fork or your hand to gently flatten each one. Preheat oven to 350F. Meanwhile, refrigerate cookies for 10 minutes. Bake for 12 minutes on the center rack. Serve with your favorite nut milk!